Each project has its own unique features and design elements, all led by the customer, and we make sure to include a full service which comprises the architect’s fees, planning permission and the finished build within the cost. Below are a number of projects which will give you an indication of what you can expect. A VIP and Press waiting area constructed on a floating pontoon for the O2 arena. See the case study here. Changing facilities at Ruskin Leisure consisting of 6 team changing rooms, 8 showers and 25 toilets as well as facilities for officials. 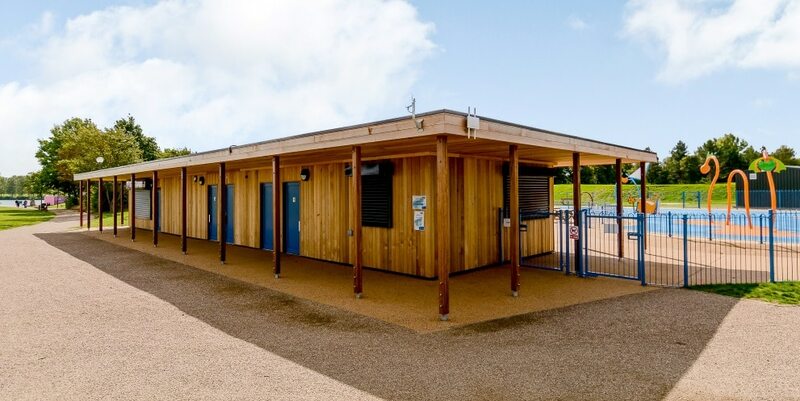 Toilets, changing facilities, an office and kitchen all in one building. Designed and built for Willen Lake Park. We were attracted by the beautiful design and the reasonable price of The Commercial Escape’s eco-buildings. Surveys are free for education and business customers only. There is a small charge for garden room surveys.